As we consider the wide set of things in the world that we would like to represent in our programs, we find that most of them have compound structure. A date has a year, a month, and a day; a geographic position has a latitude and a longitude. To represent positions, we would like our programming language to have the capacity to "glue together" a latitude and longitude to form a pair --- a compound data value --- that our programs could manipulate in a way that would be consistent with the fact that we regard a position as a single conceptual unit, which has two parts. The use of compound data also enables us to increase the modularity of our programs. If we can manipulate geographic positions directly as objects in their own right, then we can separate the part of our program that deals with values per se from the details of how those values may be represented. The general technique of isolating the parts of a program that deal with how data are represented from the parts of a program that deal with how those data are manipulated is a powerful design methodology called data abstraction. Data abstraction makes programs much easier to design, maintain, and modify. As you read the next few sections, keep in mind that most Python code written today uses very high-level abstract data types that are built into the language, like classes, dictionaries, and lists. Since we&apos;re building up an understanding of how these abstractions work, we can&apos;t use them yet ourselves. As a consequence, we will write some code that isn&apos;t Pythonic --- it&apos;s not necessarily the typical way to implement our ideas in the language. What we write is instructive, however, because it demonstrates how these abstractions can be constructed! Remember that computer science isn&apos;t just about learning to use programming languages, but also learning how they work. where both the &lt;numerator&gt; and &lt;denominator&gt; are placeholders for integer values. Both parts are needed to exactly characterize the value of the rational number. make_rat(n, d) returns the rational number with numerator n and denominator d.
Now we have the operations on rational numbers defined in terms of the selector functions numer and denom, and the constructor function make_rat, but we haven&apos;t yet defined these functions. What we need is some way to glue together a numerator and a denominator into a unit. A second method for accessing the elements in a tuple is by the indexing operator, written as square brackets. Tuples are native types, which means that there are built-in Python operators to manipulate them. We&apos;ll return to the full properties of tuples shortly. At present, we are only interested in how tuples can serve as the glue that implements abstract data types. """Return a string &apos;n/d&apos; for numerator n and denominator d."""
As the final example shows, our rational-number implementation does not reduce rational numbers to lowest terms. We can remedy this by changing make_rat. If we have a function for computing the greatest common denominator of two integers, we can use it to reduce the numerator and the denominator to lowest terms before constructing the pair. As with many useful tools, such a function already exists in the Python Library. Further reading. The str_rat implementation above uses format strings, which contain placeholders for values. The details of how to use format strings and the format method appear in the formatting strings section of Dive Into Python 3. Before continuing with more examples of compound data and data abstraction, let us consider some of the issues raised by the rational number example. We defined operations in terms of a constructor make_rat and selectors numer and denom. In general, the underlying idea of data abstraction is to identify for each type of value a basic set of operations in terms of which all manipulations of values of that type will be expressed, and then to use only those operations in manipulating the data. The horizontal lines represent abstraction barriers that isolate different levels of the system. At each level, the barrier separates the functions (above) that use the data abstraction from the functions (below) that implement the data abstraction. Programs that use rational numbers manipulate them solely in terms of the their arithmetic functions: add_rat, mul_rat, and eq_rat. 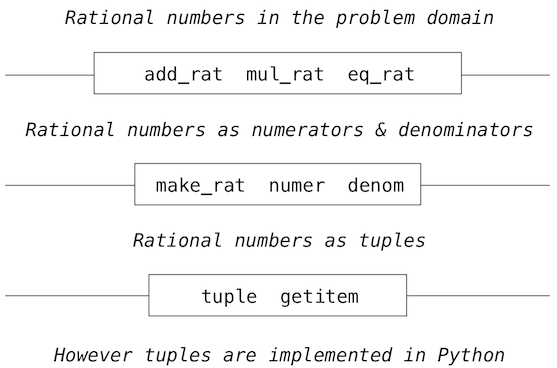 These, in turn, are implemented solely in terms of the constructor and selectors make_rat, numer, and denom, which themselves are implemented in terms of tuples. The details of how tuples are implemented are irrelevant to the rest of the layers as long as tuples enable the implementation of the selectors and constructor. We began the rational-number implementation by implementing arithmetic operations in terms of three unspecified functions: make_rat, numer, and denom. At that point, we could think of the operations as being defined in terms of data objects --- numerators, denominators, and rational numbers --- whose behavior was specified by the latter three functions. We can implement functions make_pair and getitem_pair that fulfill this description just as well as a tuple. """Return a function that behaves like a pair.""" The subtle point to notice is that the value returned by make_pair is a function called dispatch, which takes an argument m and returns either x or y. Then, getitem_pair calls this function to retrieve the appropriate value. We will return to the topic of dispatch functions several times throughout this chapter.